Although an Operating System acts like a Robot and just responds to sensory input, it does have some feature like a live species. It ages out like human or like any other live species with time. There are lots of sources of such aging like fragmentation in disk and registry, lots of junk files, invalid and junk registry entries, lots of unnecessary service and start-up items. Unlike a living system it is possible to repair and regenerate the youth of operating systems through proper maintenance. Experts hold various different opinions regarding the mode of maintenance of an Operating systems. To be on the safe side it is preferable to try each and every mode and see its outcome. In this connection, it is worthy to mention that some operating system problems may originate from faulty hardware components like Hard Disk, Sata Cable, Motherboard, SMPS etc. I usually perform maintenance of the operating system only when I see noticeable slowdown or system issues. Personally, I prefer to manually edit, clean things or with the help of minimum automation (software), because that gives me more pleasure and command over the changes to be performed. But those who are not so technically inclined and just want to have everything done with a few clicks of mouse, there are a number of system maintenance suites, free and paid. From my experience with those suites, most of those are either unable to cover up the entire maintenance protocols or just make false claims. 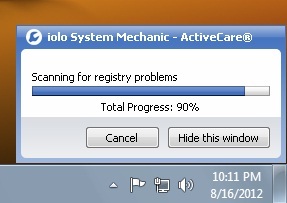 There are only a few trustworthy suites available and System Mechanic from Iolo Technologies is one of such kind. This suite has both free and paid versions available and in this post I will be discussing about the Free product. The US based company recently has launched System Mechanic 11. PC running Windows 7, Vista, or XP. In version 11 it has become fully compatible with Windows 8. CD or DVD drive (for CD-based installations. Internet connection (required for license activation)& downloading Tuneup definitions. The software can be downloaded from the following location. This download (572 Kb) is in fact the download manger of System Mechanic and will start the download once it is launched and on download finish will ask to save the installer (28 Mb) in Hard Disk. During the installation you will be prompted to choose between the Paid version (System Mechanic Standard) & the Free version. There is no trial for the Pro version, you need enter you license key for choosing that option. For the free version, you will still have to register. That will be asked later in the installation screen. Iolo will send the activation key to the entered email address from orders[at]iolo.com. It will be required later for registering the Free version. In the next part of the installation you will be asked to choose between typical & custom settings. I choose the second option. In custom installation, you will be asked to select installation directory, specify internet connection type, install PC Health Status Gadget & to send Active Care Reports to a specified email address. The software will automatically create shortcuts in Desktop & Start Menu. Upon launching the software, you will see a nice splash screen indicating the software initialization. After that you will see a welcome screen containing quick links to features overview, tutorials, full version benefits and the science behind the effectiveness of System Mechanic! You may skip that screen later by selecting Don’t show this again option. 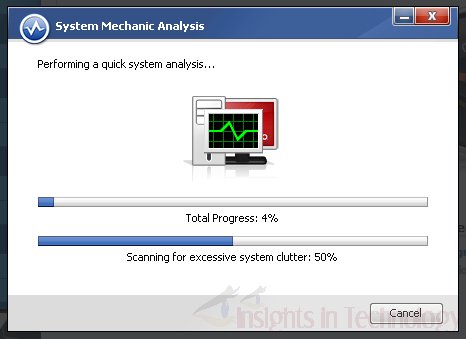 To go to the main GUI of System Mechanic click on Skip this screen. At the first look of the software was asking to activate the product and perform analysis. I did the activation first and went back to the main screen. You may also activate the product with your paid version key at this point. You will also be able to activate the paid version later by clicking on !Upgrade Available button. The software offers quick and deep analysis, I choose to perform the quick analysis first. After the analysis, I got some recommendations to take care of. I was also offered to print the report. I let it to Repair All, which it completes within a minute. A system restart was recommended. 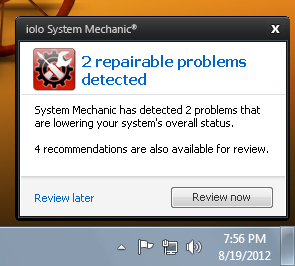 It still asks to perform a deep analysis to dig into better details of the system problems. Deep analysis indeed found more problems, most of which were curable with the pro version. Restarting Windows from the software GUI will give you 1 minutes to save your job. After the restart and software launch, I found the nice GUI with some recommendations! PC Health Status Gadget will show the Problems, Warnings, Recent Actions and Shortcuts to Key Areas of the software on its full mode. It also offers a button to launch the main GUI. Although the software suggest to upgrade to paid version for turning on automatic Active Care. 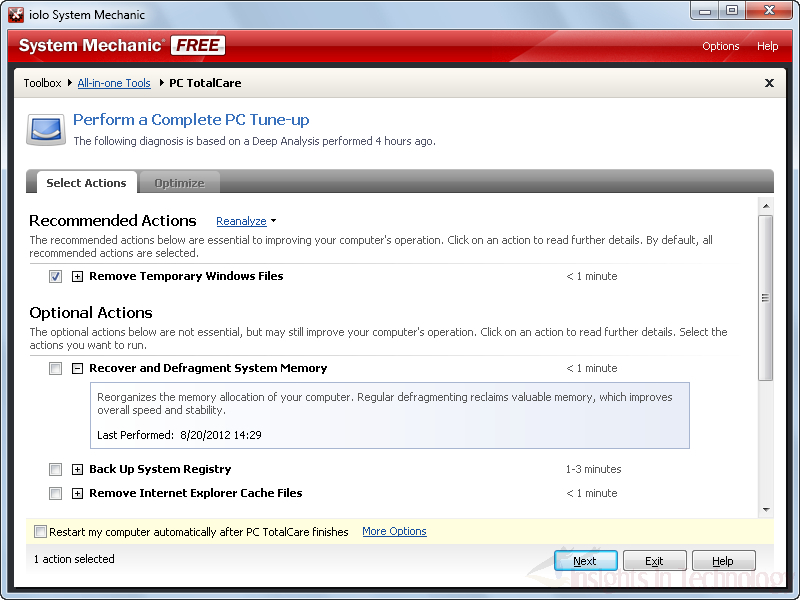 In the free version the software scans system at idle time and show tray notification regarding maintenance. Active Care frequencies and options may be managed from the settings. Unlike one-size-fits-all “cleaners” or “utilities” that dangerously attempt to apply a single set of fixes to every PC (sometimes causing more harm than good), System Mechanic is able to intelligently adapt to a limitless variety of configurations, installed software, or special environments. This allows it to create a set of personalized tune-up actions custom-tailored for your specific PC — each time you use it! System Mechanic is set to take backups of the maintenance jobs, which may be used to undo any undesired consequences resulting from the maintenance. You may choose the components to keep the backup. The software can correctly detect and monitor the status of installed Antimalware & Firewall. If Windows Firewall is active, it is possible to launch that from System Mechanic GUI. System Mechanic Toolbox may be accessed via All-in-one Tools & Individual Tools. The main tools is PC TotalCare® combines the most critical repair, speed-boosting, cleanup and protection tools into one wizard. From the All-in-one Tools you may also launch individual components, without opening the PC TotalCare. 1. PC Accelerator: PC Accelerator combines all the essential speed-boosting tools into one wizard. You can defragment hard drives, defragment memory, defragment the registry, realign programs, maximize solid-state drive speed and optimize your Windows startup and Internet settings. PC Accelerator also makes specific recommendations based on an analysis of your computer’s needs. Please note that the last few options, “defragment the registry, realign programs, maximize solid-state drive speed and optimize your Windows startup and Internet settings.” are not available in free version. 2. PC Repair: PC Repair combines several essential diagnostic and repair tools into one wizard. You can repair registry errors and hard drive problems, repair a broken Internet connection, remove invalid installation files, and remove broken shortcuts. Please note that, repairing hard drive problems are not available in the free version. 3. PC Cleanup: PC Cleanup automatically detects and cleans out temporary files and other useless data. You can empty the Recycle Bin, and remove cookies, offline files, cache files, temporary files, and unused downloaded program files. PC Cleanup also makes specific recommendations based on an analysis of your computer’s level of clutter. 4. PC Security: PC Security combines the essential protection tools into one wizard. You can back up the system registry and repair security flaws that leave you open to attack. PC Security also makes specific recommendations based on an analysis of your computer’s current protection. The individual tools are again classified into different category. All total 15 tools are reserved for the free category. Increase Performance: The Increase Performance tools maximize the speed of your computer and improve overall performance. Memory Mechanic: Defragment the RAM to improve overall speed and stability. Startup Optimizer: Improve performance by safely turning off unnecessary and unwanted startup programs. DriveAccelerator: Defragment drives to increase PC speed and drive reliability. Registry Backup: Protect the registry by scheduling regular backups or by doing backups and restorations on demand. Clean Up System Clutter: The Clean Up System Clutter tools clean out unneeded files to free up drive space, memory, and other system resources. All tools in this section are available in the free version. PC Cleanup: Automatically detect and clean out temporary files and other useless data. Junk File Finder: Clean out obsolete and unneeded files based on the criteria you choose. Registry Tuner: The Repair Registry Problems wizard removes invalid and obsolete data references from the registry. Shortcut Repair: The Repair Broken Shortcuts wizard searches your computer for broken shortcuts. Where a previously linked file is still on your computer, you can automatically update the shortcut with the new location, or you can choose to remove obsolete shortcuts you no longer need. Privacy Cleaner: The Erase Private Data “Privacy Cleaner” wizard protects privacy by erasing browsing and search history, cookies, chat transcripts, and other personal information. Incinerator: The Securely Delete Files wizard permanently and securely deletes the files and folders you specify. Duplicate File Inspector: See a list of duplicate files that may be unnecessarily taking up drive space. Advanced Uninstaller: Thoroughly uninstall application files to eliminate sluggish performance. Advanced System Information: View a comprehensive list of your PC’s hardware, software, memory, installed devices, and more. 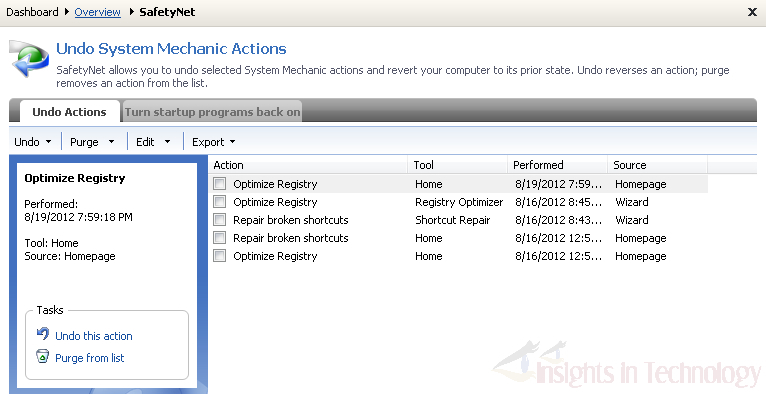 System Change Tracker: Track changes to your PC after performing system-modifying actions such as installations. Manage Add-ons: The Manage Add-ons tools for Vista, Windows 7 & 8 users enable access to bonus mini-programs that supplement System Mechanic. It includes PC Health Status Gadget, which I already mentioned earlier. System Mechanic can show IntelliStatus (Hard Disk & System Memory Usage) and the History of all tuneup operations. You may also reset the statistics. The software offers automatic updates. It has options to set-up connection settings to use under proxy with authentication. 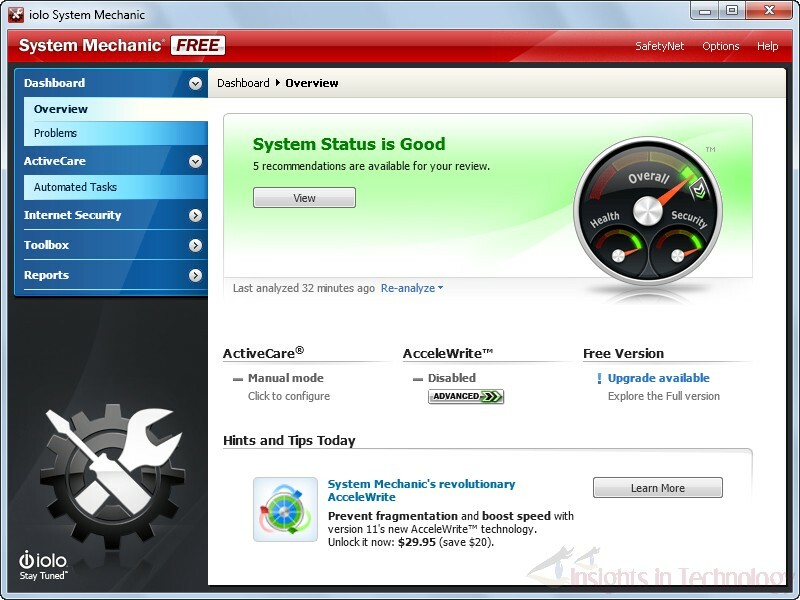 System Mechanic offers extensive offline & online help documentation along with several online text and video tutorials. The Software GUI at idle time uses low memory but during duplicate search or tuneup, it consumes moderately high resources. I had been testing System Mechanic since the last month and have explored most of the features it have. 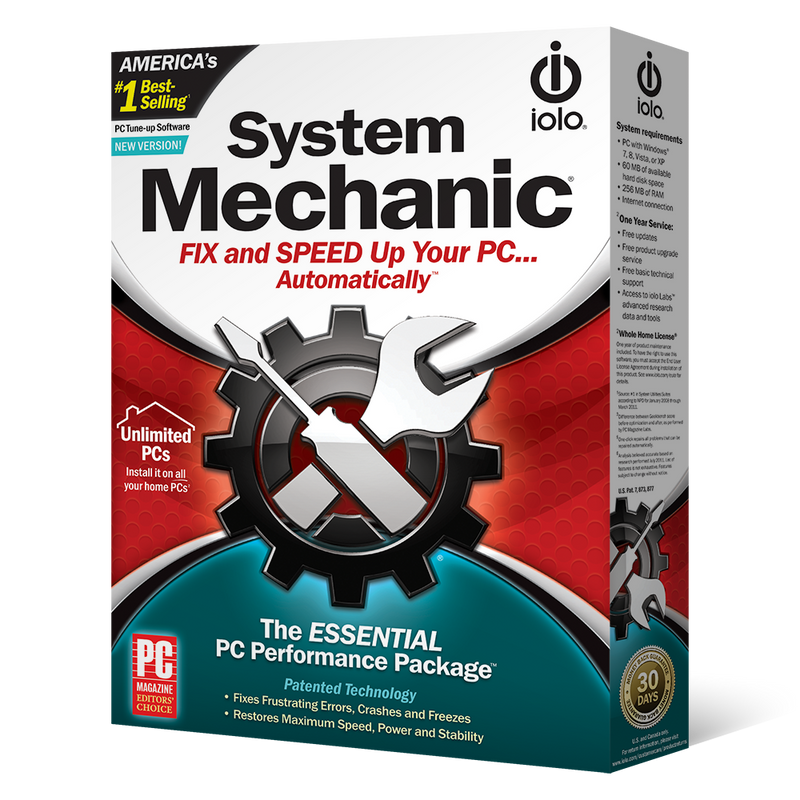 Very rare freeware products offer such a wide variety of features in free version like System Mechanic Free have. I also apologize for not reviewing all the features in detail. You must understand that its not possible to review all the vast number of features in a single post. So, I have been very brief, even the number of screenshots provided are less. I have given links to the screenshot in all possible cases. This suite has some shortcomings. It does not show the results of a scan in all cases like while erasing privacy. It will become more complete if it can clean more junk files resulting from different installed applications. CCleaner has such an wide variety of cleaning abilities. it should also be able to remove unneeded system restore points for saving more disk space. Nothing is perfect in this world; but I must say System Mechanic has become almost perfect owing to its ease of use, automation & all-round abilities. I highly recommend the software. This entry was posted in Backup, File Management, Free, OS Enhancement, OS Maintenance, Privacy Related, Security Related, Shred, Software, Windows.